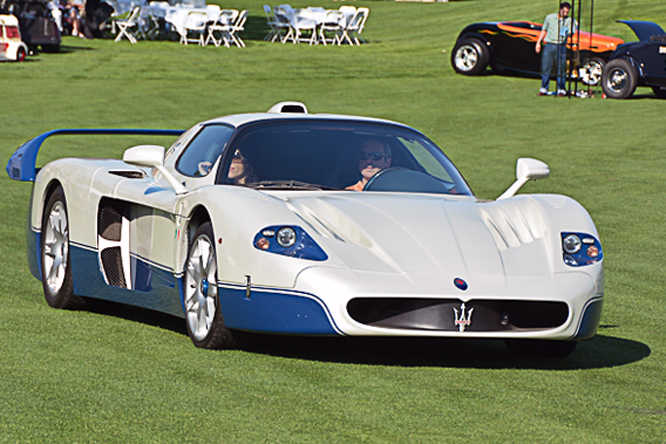 The Maserati MC12 Stradale is the road going variant of the Maserati MC12 Competizione which successfully took Maserati back to the race tracks on the FIA GT Circuit in 2005. 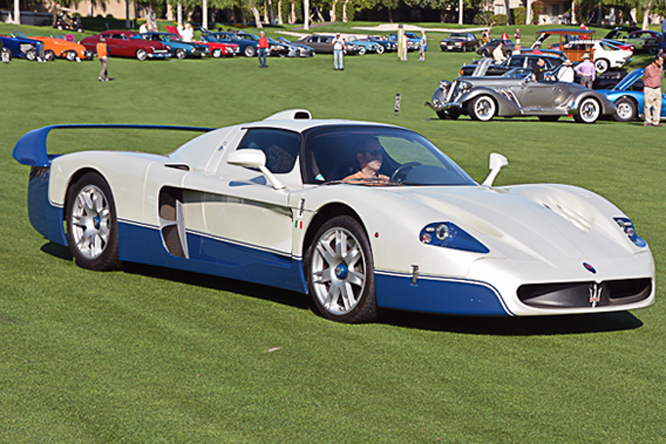 Sharing a chassis, modified motor, running gear and windscreen with the Enzo Ferrari the rest of the body was originally conceived by Giorgetto Giugiaro and stylised with the aid of a wind tunnel by Frank Stephenson. 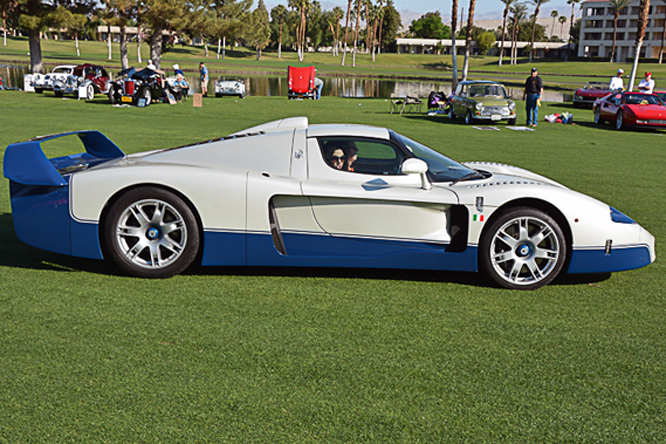 The two batches of 25 MC12 Stradales built in 2004 and 2005 were only delivered in white and blue, sans radio or even anywhere to fit an after market one, a nod to the exploits of the American Lloyd Perry ‘Lucky’ Casner’s Camoradi team. In two separate road tests at Dunsfold Aerodrome and on the Nurburgring MC12’s proved to be quicker than the Enzo Ferrari that spawned it. 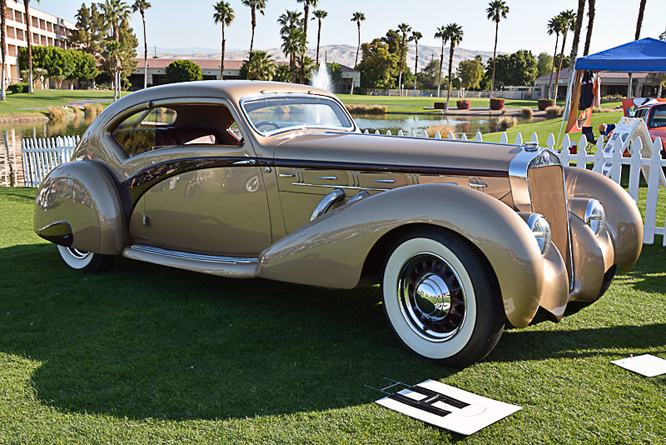 I believe the example seen here in Geoffrey Horton’s photograph’s, taken at last years Desert Classic’s Concours d’Elegance, is one of those built in the 2005 batch. It appears to belong to the The Riverside International Automotive Museum a non profit corporation run by Ray and Doug Margon dedicated to “Preserving the memory of California’s rich motorsports heritage” which also houses a collection that includes one example of every road going Maserati sold in the US since 1951. Thanks for joining me on this “Faster Than Enzo” edition of “Gettin’ a li’l psycho on tyres” I hope you will join me again tomorrow when I’ll be looking at an early Renault. Don’t forget to come back now ! 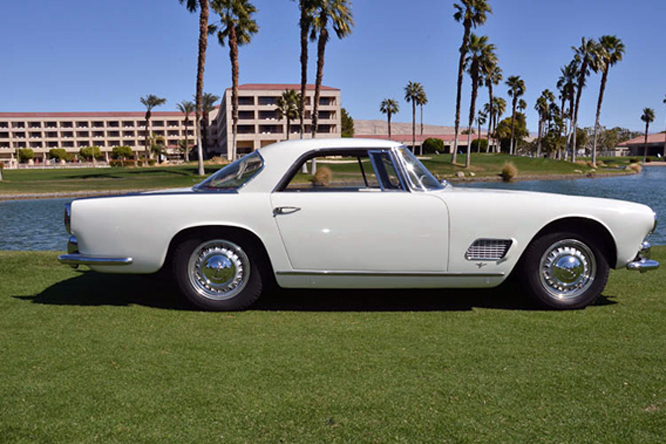 This entry was posted in Uncategorized and tagged Automotive, Camoradi, Classic, Colmar, Concours, Crasner, d'Elegance, Desert, Enzo, Ferrari, Geoffrey, Giugiaro, Horton, International, Margon, maserati, MC12, Museum, Psychoontyres, Ralph, Riverside, Stephenson, Stradale on August 31, 2015 by Ralph. 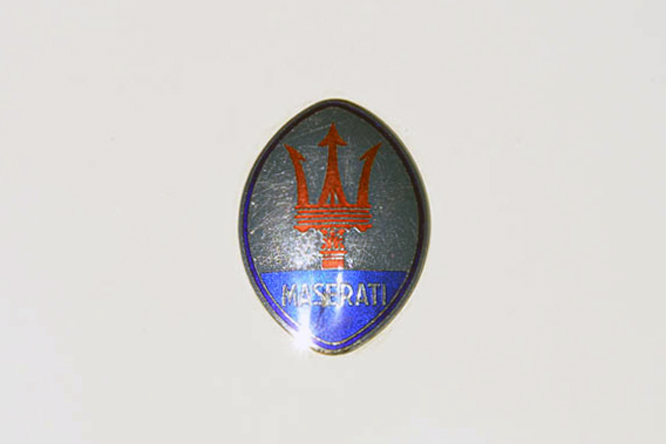 When he was 24 Francis G Mandorano had the opportunity to visit the Ferrari and Maserati factories in Italy where he got the Maserati Bug. 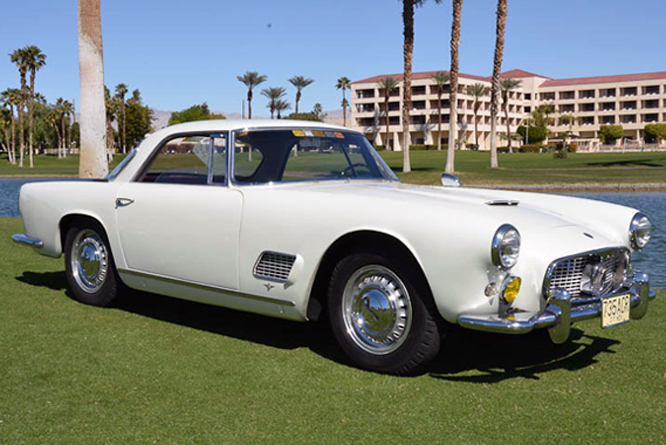 Francis the owner of today’s featured 1959 Maserati 3500 GT chassis #101.686, describes himself as a one trick pony, his passion is for Maserati 3500 GT’s of which he now has several. 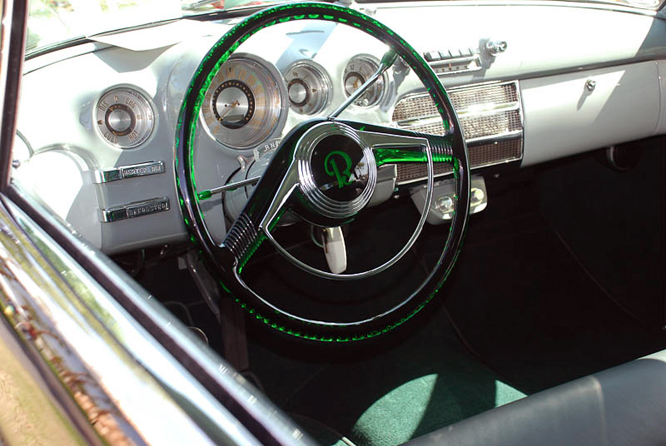 #101.686 is believed to be one of five cars sold in Mexico City. 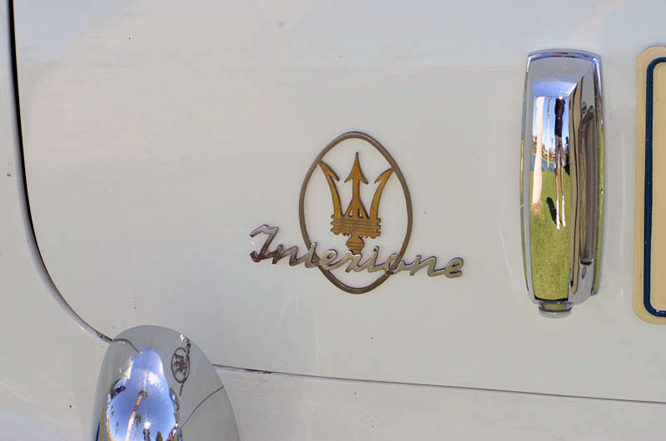 In 2002 the third owner of 101.686 Sam Bardor sent the six cylinder engine sent to Mr Maserati Ken Doughtery for a $25,000 rebuild. 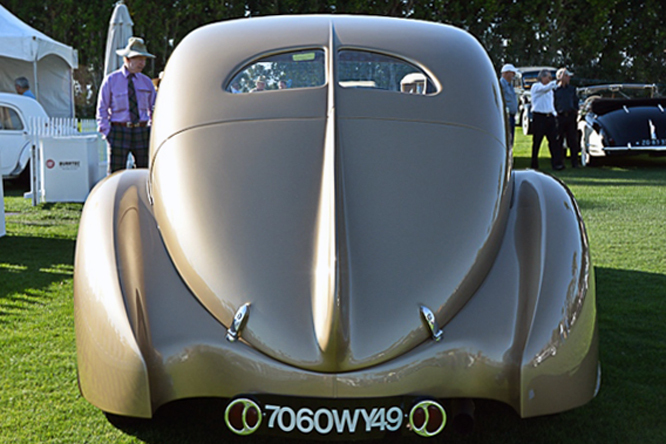 With 220hp coming from the all aluminium straight six engine Frank reckons he can get up to 26 mpg on the highway from this car which he calls “The Latina”. The car is still in it’s factory Bianco Neve colour and has a red leather interior with plenty of room for the long legged driver. 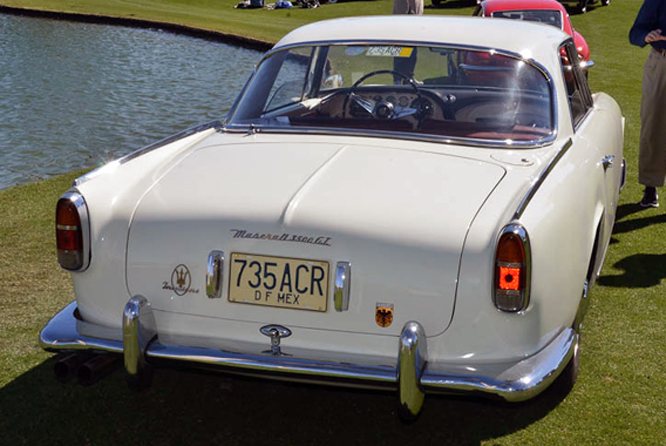 Francis bought #101.686 in 2011 and had it fully restored to it’s present condition. 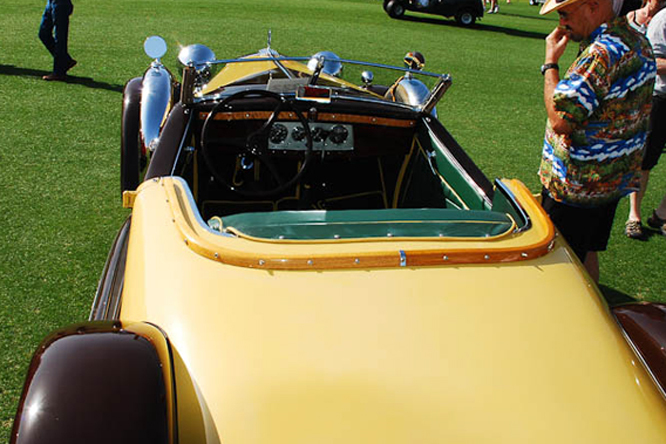 He says of the car “It’s really a work of art” going on to say that his favourite part of the car is the noise concluding “when you have it on stainless steel exhaust and it’s tuned properly it’s primal”, which you can enjoy a little of on this link. 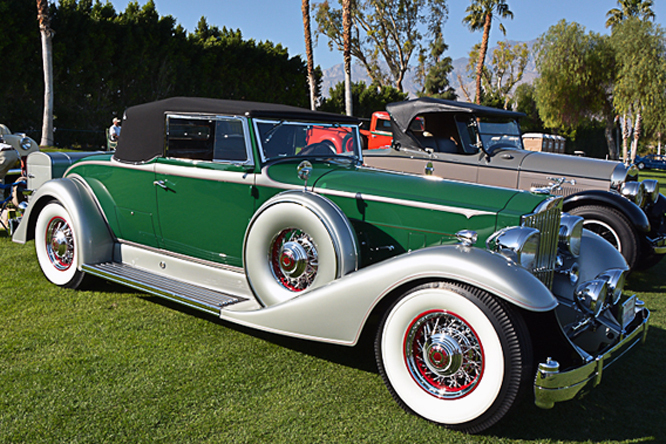 My thanks to Geoffrey Horton for sharing these photographs taken at the Desert Classic Concours d’Elegance, Palm Springs, a couple of years ago. 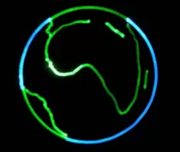 Thanks for joining me on this “It’s Primal” edition of “Gettin’ a li’l psycho on tyres” I hope you will join me again tomorrow when I’ll be looking at another Peugeot. Don’t forget to come back now ! 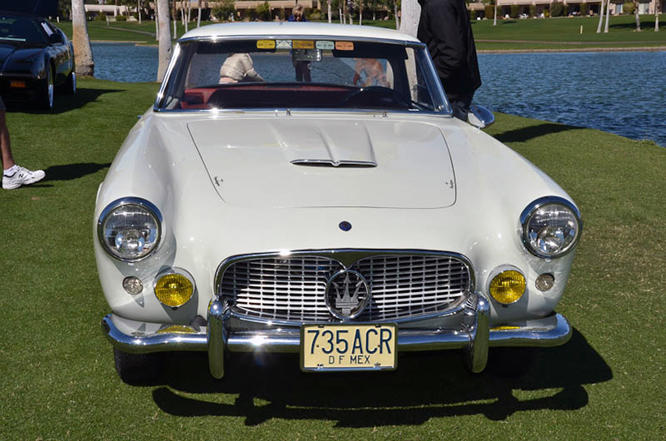 This entry was posted in Uncategorized and tagged 3500, Classic, Colmar, Concours, d'Elegance, Desert, Dougherty, Geoffrey, GT, Horton, Mandorano, maserati, Palm, Psychoontyres, Ralph, Springs on August 17, 2015 by Ralph. 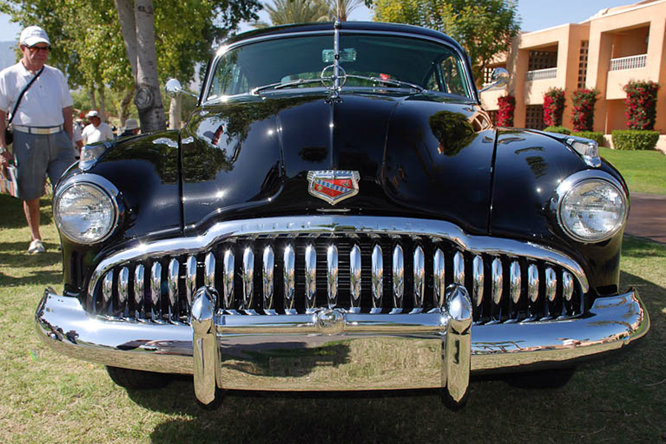 From 1936 to 1996 Buick manufactured eight generations of Roadmaster, with an interruption from 1959 to 1990, Roadmasters were Buicks flagship model from 1946 to 1957 sharing underpinnings with contemporary entry level Cadillacs and senior Oldsmobiles. 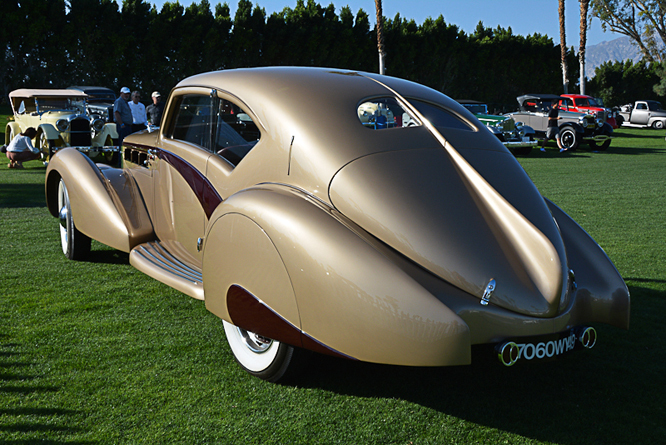 The car seen in Geoffrey Horton’s photo’s seen here at the 2012 Ranchero Mirage Desert Classic Concours d’Elegance feature a 1949 Roadmaster from the first year of production of the fifth 1949 -1953 generation which were the first to feature a two part curved ‘observation car’ windscreen. Note the bombsite mascot is a feature of all post 1946 Roadmasters. 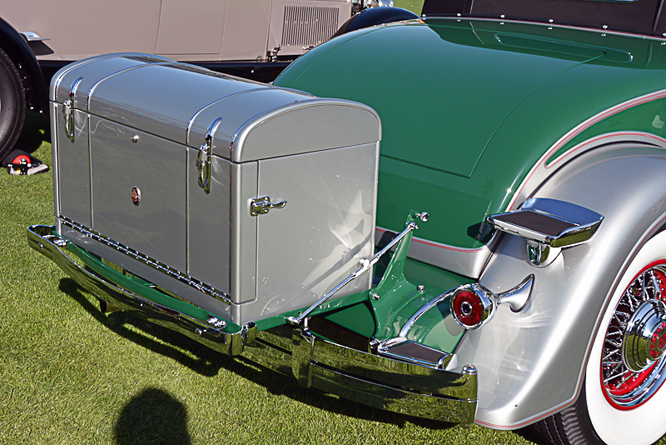 The three Ventiports on front wing / fender of this Roadmaster indicates that is probably powered by a 5.2 litre / 320 cui ‘Fireball’ straight eight motor originally good for 165 hp, which following a change in carburation dropped to 144 hp in 1946 but was raised again in 1949 to 150 hp by increasing the compression ratio. 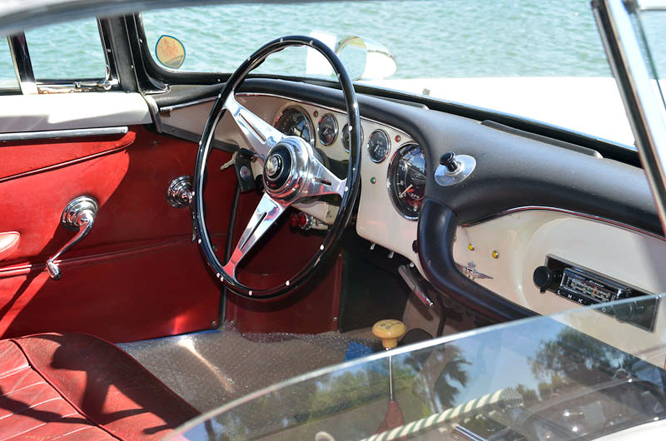 New for 1948 was a two speed Dyna Flow transmission developed from Buicks tank manufacturing program during the Second World War, making this the first model ever to be sold with a torque converter. For 1949 Dyna Flow became the mandatory transmission on all Roadmasters. 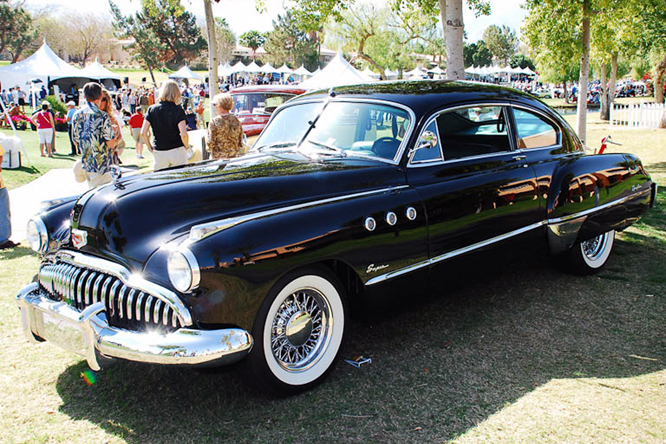 When the Roadmaster was first launched in 1942 the Coupé featured the same fastback Sedanette styling that had been a sensational feature of the 1941 Buick Century and Special models. 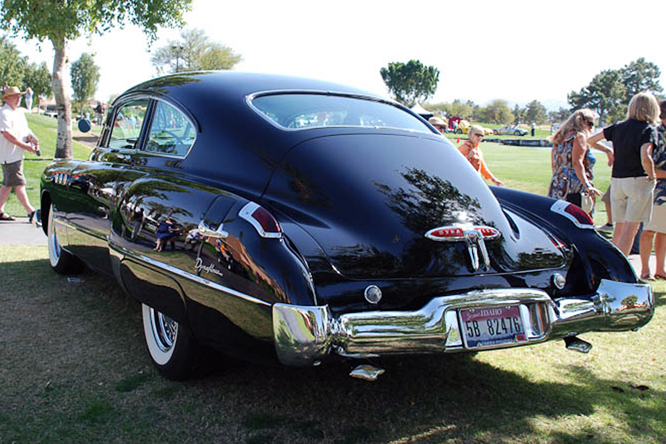 During 1949 the Roadmaster accounted for 27% of Buicks production with around 88,130 units sold. My thanks to Geoffrey Horton for sending me his photographs. Thanks for joining me on this ‘Fireball Dyna Flow’ edition of ‘Gettin’ a li’l psycho on tyres’, I hope you will join me again tomorrow. Don’t forget to come back now ! Errata this vehicle was originally incorrectly identified as forth generation 1948 model, however since then it has become apparent that 1948 Roadmasters had a flat windscreen and did not feature the VentiPorts in the wings / fenders. 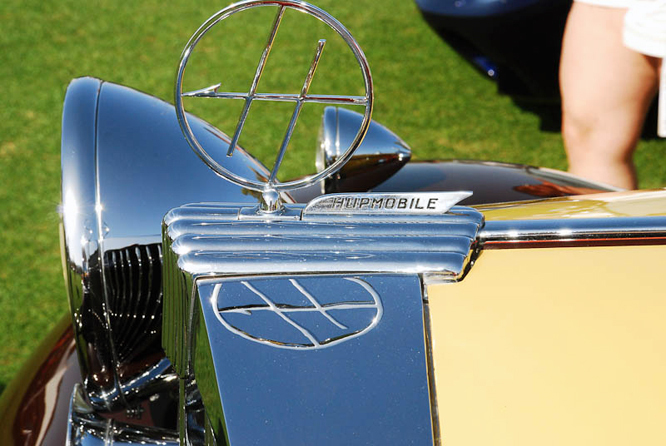 This text has been updated to reflect details of the ’49 Roadmaster. 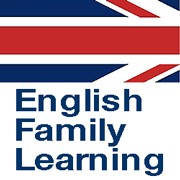 Apologies for any confusion caused. 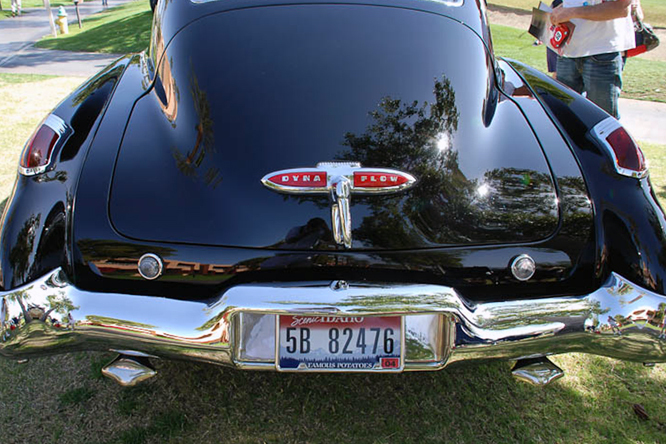 This entry was posted in Uncategorized and tagged Buick, Classic, Colmar, Desert, Dyna, Fireball, Flow, GALPOT, Geoffrey, Horton, Ralph, Roadmaster on April 19, 2012 by Ralph. 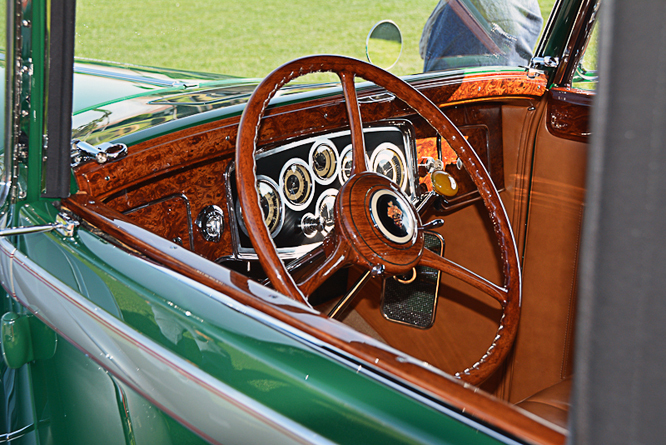 Photographs of today’s featured car, a Delahaye 135 Competition, come courtesy of Geoffrey Horton from February’s Dessert Classic Concours d’Elegance. 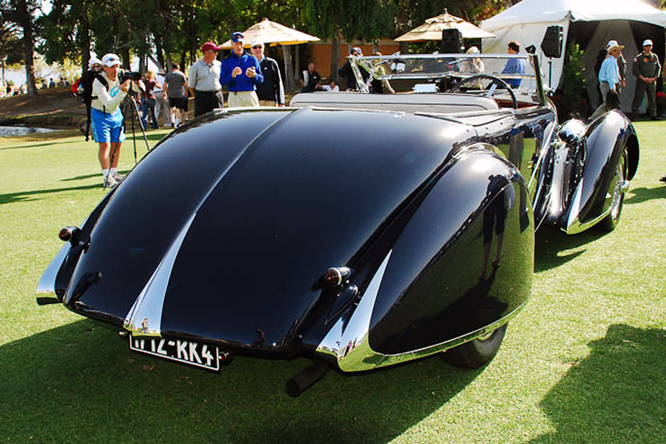 The 135 Competition chassis was designed as a road car, this one has a Figoni & Falaschi body originally built in 1936. at least half a dozen French Coachworks offered bodies for the 135 chassis so no two are exactly alike. 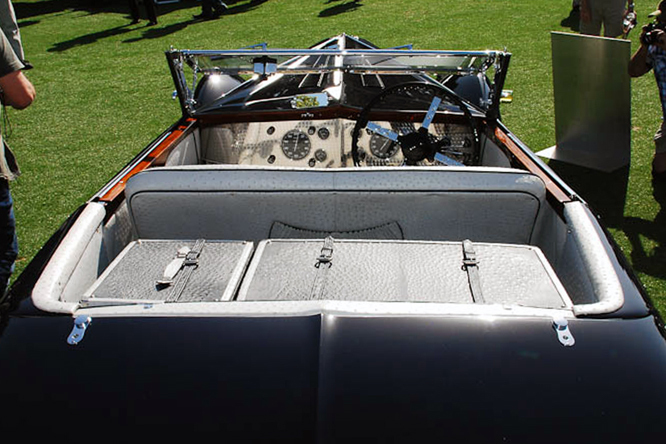 Underneath the striking bodywork the 135 featured independent front suspension and 120 hp 3.6 litre / 217 cui six cylinder motor. 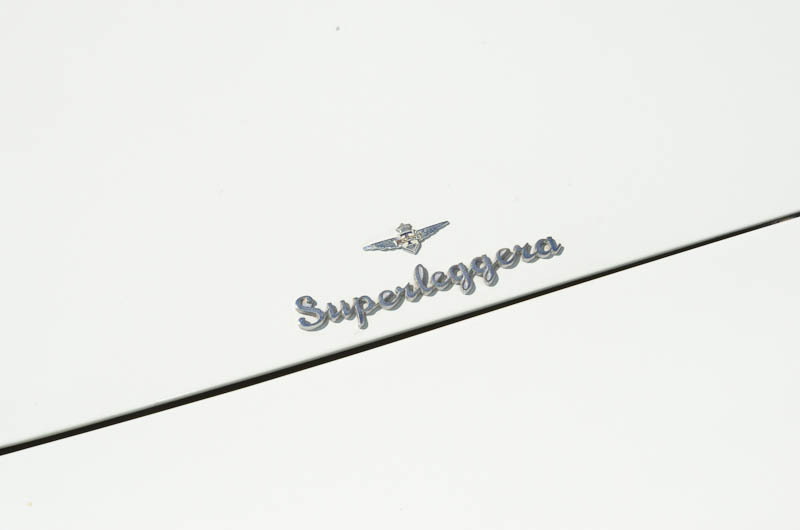 Variations of the 135 chassis recorded victories 1935 Coupe des Alpes, 1937 Monte Carlo Rally and 1938 Le Mans 24 Hours events. 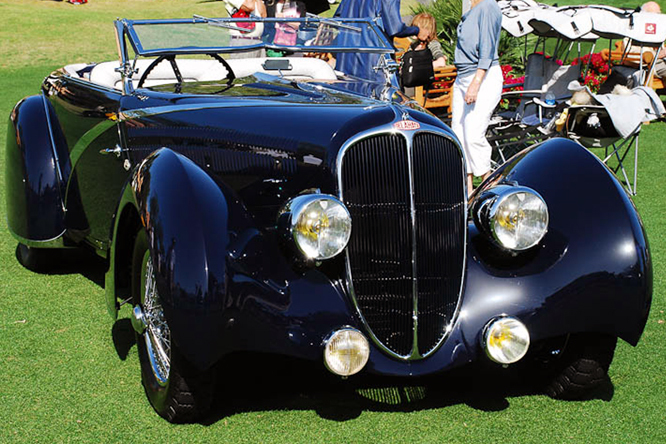 Between 1935 and 1938 it is believed 453 Delahaye Competition chassis were built. 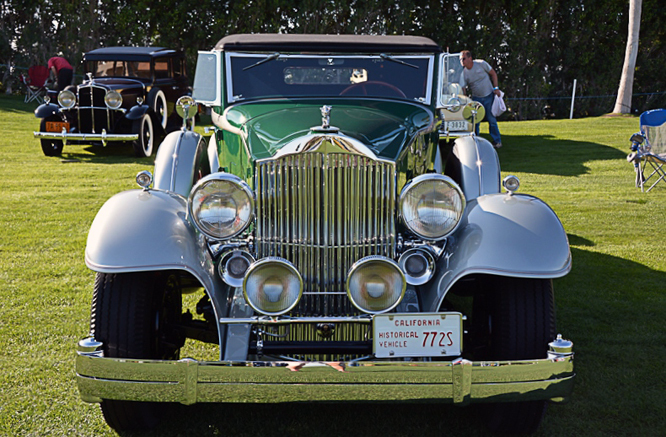 My thanks to Geoffry Horton for sending me his photo’s of this magnificent vehicle. Thanks for joining me on this ‘Continental Elegance’ edition of ‘Gettin’ a li’l psycho on tyres’ I hope you will join me again tomorrow. Don’t forget to come back now ! 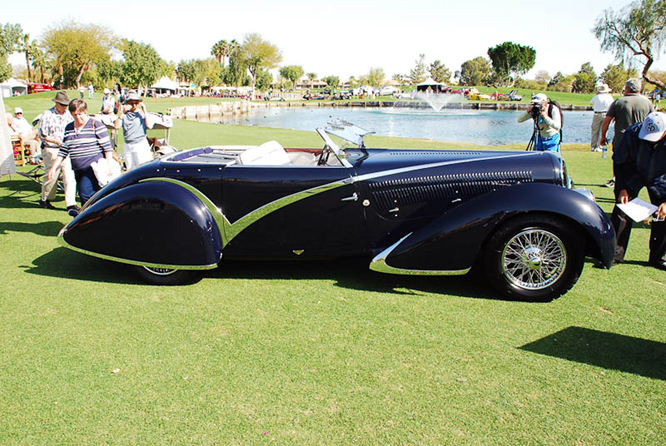 This entry was posted in Uncategorized and tagged 135, C d'E, Classic, Colmar, Competition, Delahaye, Desert, Falaschi, Fignoni, GALPOT, Geoffrey Horton, Ralph on April 8, 2012 by Ralph. 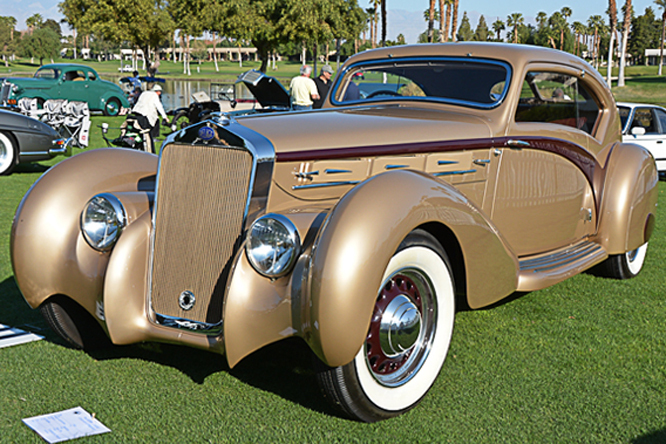 Hupmobile, founded by former Ford and Oldsmobile employee Robert Craig Hupp and his brother Louis Gorham Hupp was a Detroit automobile manufacturer from 1908 to 1940 which built it’s reputation on solid some say stodgy 4 cylinder automobiles. 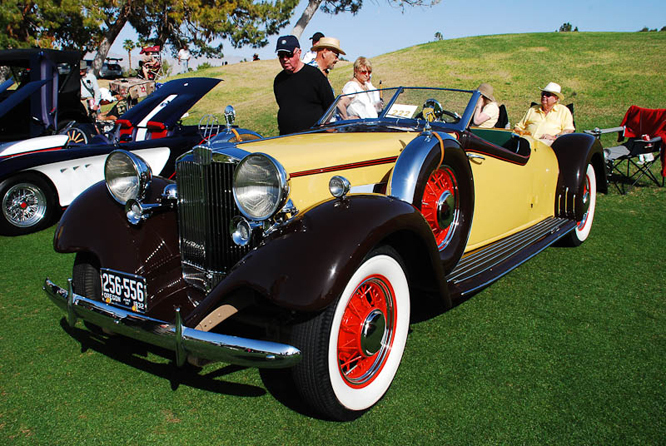 In 1925 Hupmobile introduced it’s first 8 cylinder model abandoning it’s traditional customer base with the onset of the depression as in pursuit lucrative top end markets. 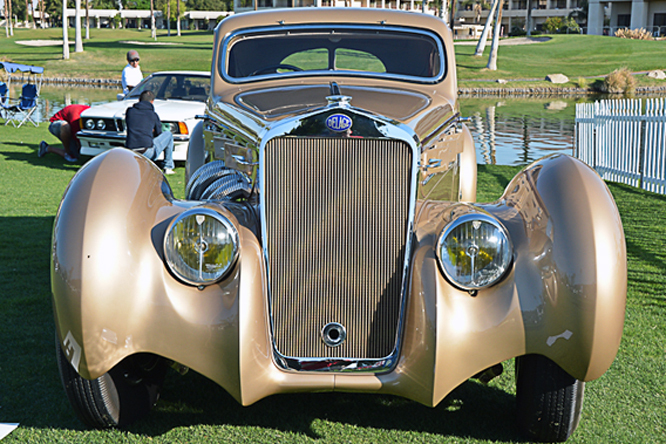 Raymond Loewy is credited with the design of this 1932 Speedster powered by a 103 hp straight eight motor, referred to in advertising for an earlier model as giving ‘Big Bertha’ power. 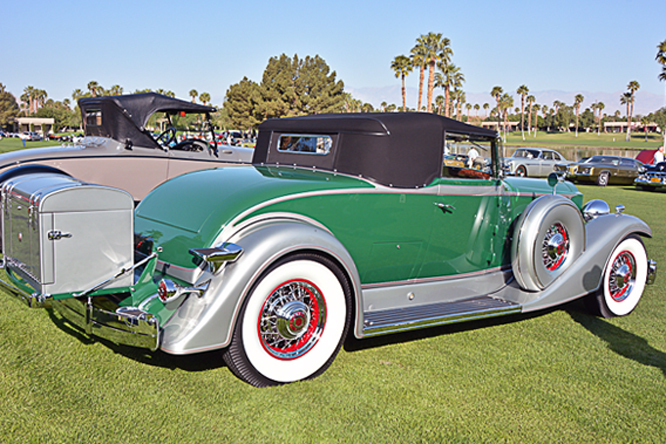 The car featured, in these photo’s by Geoffrey Horton taken at the Desert Classic Concours d’Elegance, is thought to be the only survivor of three built that were aimed squarely at the market segment occupied by Packard and Auburn. My thanks to Geoffrey Horton for sending me the photographs. Thanks for joining me on today’s Big Bertha Power edition of ‘Gettin’ a li’l psycho on tyres’, I hope you will join me again tomorrow. Don’t forget to come back now ! 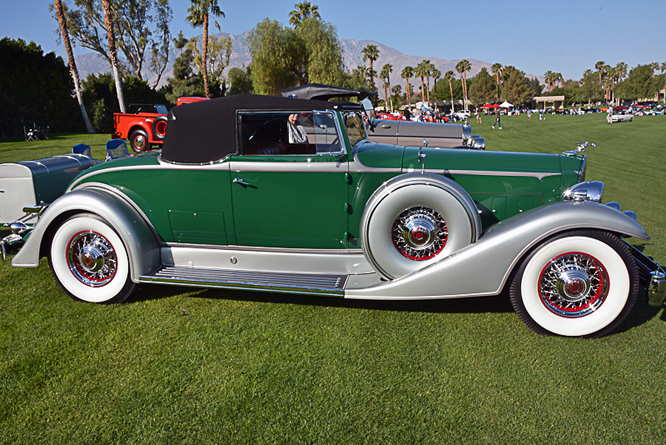 This entry was posted in Uncategorized and tagged Classic, Colmar, Concours, d'Elegance, Desert, GALPOT, Hupmobile, Hupp, Loewy, Ralph, Speedster on March 22, 2012 by Ralph.